TO LEARN HOW IT WORKS! Camp for the next 12 months with no nightly fees. Pick one of 5 zones and pay only $585. Add additional zones for just $54. 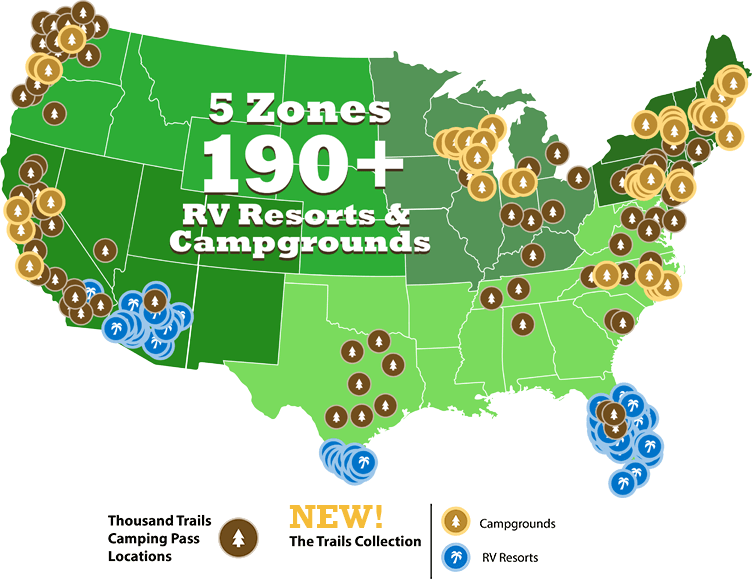 Get 100+ more campgrounds nationwide with The Trails Collection for $214. Our 81 campgrounds are divided among 5 camping zones: Northwest, Southwest, Midwest, Northeast and Southeast. 14 Campgrounds from New England to Pennsylvania! Cape Cod, Amish Country, and the Jersey Shore are just a few of the best campsite and RV resort areas located in this region. 23 Campgrounds from North Carolina to Texas! The Chesapeake Bay, Blue Ridge Mountains, Diamond Caverns in Kentucky are just a few of the best campsite and RV resort areas located in this region. 18 Campgrounds in British Columbia, Oregon and Washington! Top destinations like Puget Sound by beautiful Seattle, the untouched splendor of the Oregon Coast, and even British Columbia. 18 Campgrounds in California, Nevada, and Arizona! Great skiing and swimming at Lake Tahoe, the awe-inspiring grandeur of Yosemite National Park, and fun of Las Vegas are just a few of the things you can do at some of the best campsite and RV resort areas located in this region. 8 Campgrounds from Ohio to Kentucky! Diamond Caves and the Great Lakes are just a few of the best campsite and RV resort areas located in this region. For a limited time, get 100+ additional destinations nationwide for only $199 per year! Explore amazing RV resort and camping locations, including Encore RV Resorts and many more top campgrounds across the country. The Trails Collection is only available to new purchasers of the Thousand Trails Camping Pass, or existing Thousand Trails members. So, don't delay! Become a member and get in on the deal! See what each zone has to offer you below. Select individual campgrounds for even more details! Buy a Thousand Trails Camping Pass by April 19th & Save $150 OFF Regular $585 Price. Hurry, sale only lasts 72 Hours! If you purchase a Thousand Trails Camping Pass and are not satisfied for any reason you may cancel your purchase agreement and receive a refund. How long is my Thousand Trails Camping Pass good for? The Thousand Trails Camping Pass is good for one year if you elect to pay in full at the time of purchase, or 24 months if you elect to pay in monthly installments. At the end of your first camping year, your Pass will automatically renew for additional one-year periods unless you inform us that it's time to take a break. You can always purchase again in the future when ready! Can I bring pets to the campground with me? Yes, Thousand Trails campgrounds are pet friendly! Your furry friends are free to join you for overnight camping or day use at Thousand Trails campgrounds. Please check the campground rules for more details on our pet policies before first bringing your pets along. Who may use my Thousand Trails Camping Pass? 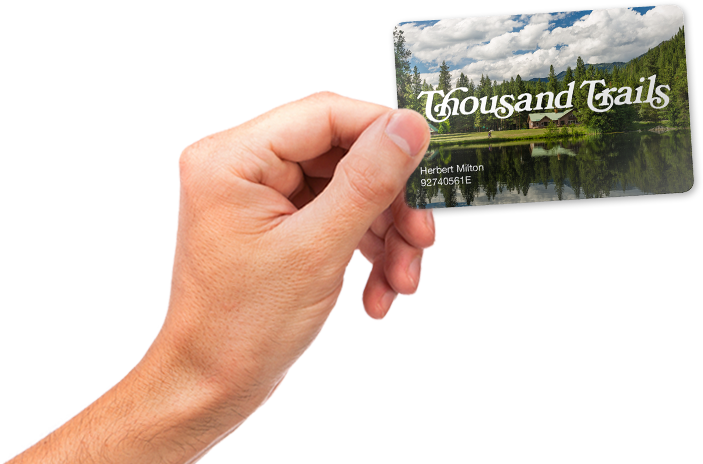 Your Thousand Trails Camping Pass covers the purchaser, his/her spouse, and any dependent children age 23 and under who live at home or attend school away from home. Other family members may use the campgrounds as guests (see usage rules). Our spacious campsites can accommodate up to 10 persons, so don't forget to bring your friends along! Booking reservations is easy with your Thousand Trails Camping Pass. As soon as you purchase your Pass, you can begin booking your reservations online through our website or by calling one of our friendly Trip Specialists toll-free at the Thousand Trails Reservations Center. 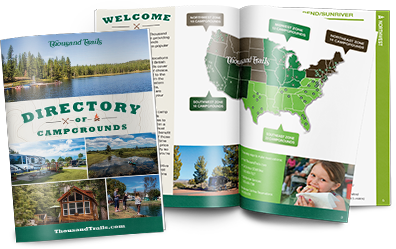 Thank you for your interest, please click below to download your free Camping Directory!